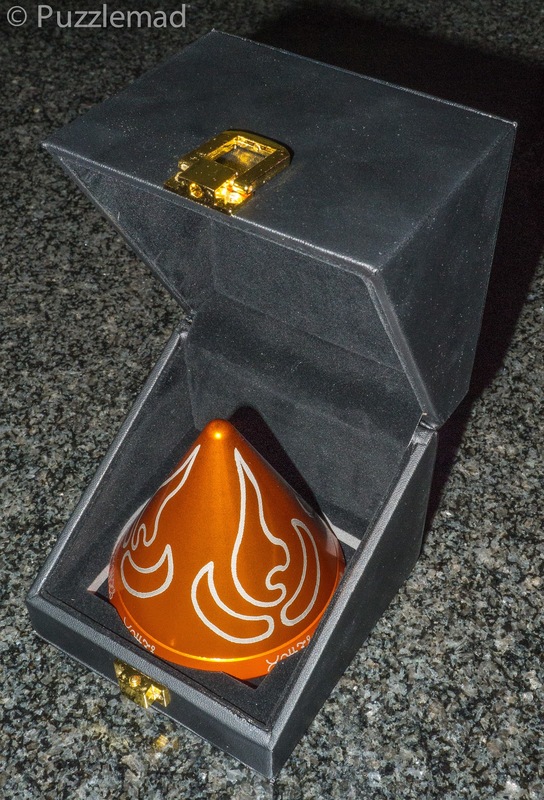 Many months ago (it was sometime last year) Wil Strijbos released his last update and many of us in the puzzle world jumped into our bank balances and sent as much as we could to Wil. I know I did! 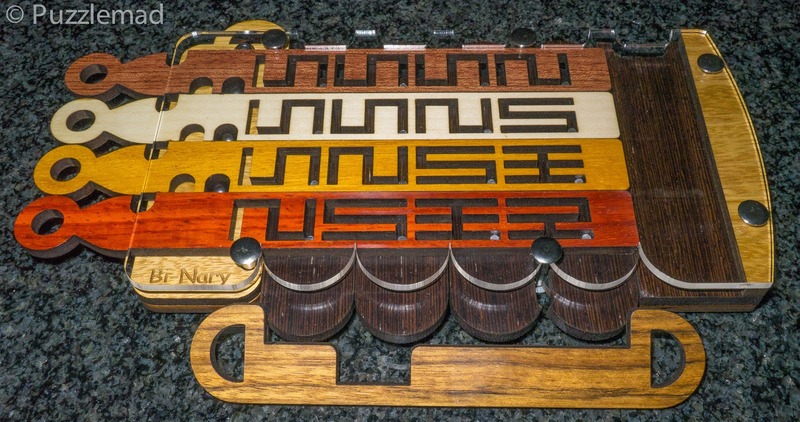 One of the puzzles in his last selection was the Bi-Nary puzzle which was a new N-Ary design by the great Jean Claude Constantin. 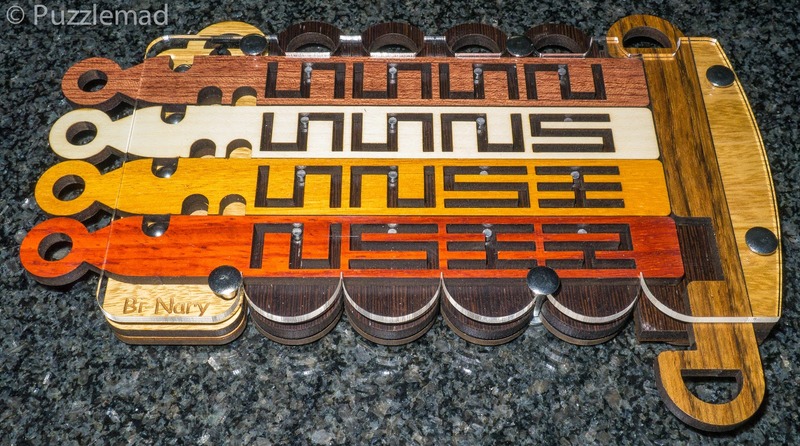 Everyone in the world knows now how addicted I am to this group of puzzles and one of them (Labynary) even made it to number 5 in my top puzzles of 2014. So of course, I couldn't resist it and it (along with a few others) was quickly winging its way from The Netherlands to me in the Midlands of the UK. My original arrived and I was a little disappointed that a piece of the primary slider had been snapped off in transit. However it looked very delicate and was relatively easy to fix with a bit of wood glue and some small clamps. You can see the amateurish repair in the bottom right of the photo below. This stopped me playing for the first few days. I can't remember why (I suspect I got distracted by another toy in the package) but I didn't dive into it straight away after I had repaired it. Another reason for not playing immediately was that it scared me to death! There seemed to be so many parts that moved and interacted with each other. In a way I was lucky I didn't start quickly - I was part of a 3 way email conversation with Allard and Goetz who were complaining that it seemed more difficult than it should be and that they suspected there was an error in its' manufacture. I am not really qualified to be able to analyse a puzzle of this complexity to discover whether it can be solved or not so I kept an eye on the analysis that Goetz did. There is probably no one in the world apart from JCC himself other than Goetz who is better qualified to carry out an analysis of these sort of puzzles. Once Goetz had pronounced it insoluble, I just put it aside to wait for a fix. It took a month but JCC agreed with the analysis and worked out a fix to make it solvable. This involved pulling out a metal knob and seemed to me to be an ugly solution but I was reassured by a communication from JCC (via Wil) that a new version was being produced that functioned correctly and would be provided to all those who bought the faulty one. So we all waited and at the last MPP Wil attended and handed over the replacement puzzles - you can see from the picture below that JCC used the time as an excuse to make it more sturdy and more colourful as well as to fix the mazes to allow it to work. After I received the new version I put in in my work bag in the hope that I'd get some time to play and maybe even solve it. But every time I did get a moment, I was either side-tracked by something else (you may not be aware of it but I do seem to have quite a few toys waiting to be played with!) or I shied away from it in fear - so much movement and SO MANY obstructing elements! Finally, I had a few days off this week and, whilst I did have quite a bit of office work to do, I also had plenty of time to play. Unfortunately I was sick for most of the week and so had little to do except lie around and idly play with my toys! I brought out the Bi-Nary for some investigation. I was a little skeptical at the name - looking at the mechanism and the difficulty, it cannot have been a member of the Binary puzzle group as it's name suggests. In fact it is based on the 6 bottles puzzle which I have never actually reviewed but Gabriel has discussed it here and the N522 puzzle (which does have some similarity to the Labynary). Goetz has insisted that both of these are base 3 or Ternary puzzles - so how come this one is called Bi-Nary? Well it took a while for my density (?denseness) to wain and of course I realise now that it is not Binary! It is based on 2 different puzzle mechanisms and hence it is actually Bi-N-ary!! A play on words which only took me about 5 months to fathom! It's no wonder that I can't solve the Fire Puzzle from Steve - I have all the clues but have no idea how to interpret them! Solved at last! Only took me 5 months! Labynary - the best N-ary ever! 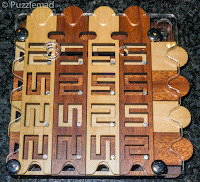 This is a marvellous puzzle - making an N-ary puzzle that is a combination of 2 others is VERY clever and VERY confusing. It is not quite as arduous or as challenging as my beloved Labynary puzzle but I absolutely love it and can heartily recommend it to you. Hopefully some of the usual puzzle purveyors will have it in stock for a while! Try contacting Wil if he is your usual supplier or from Puzzle Master in Canada. I'm not sure whether Hendrik in Germany, Tomas (Sloyd) in Finland or Brian in Australia will have it in stock but there's no harm in asking! 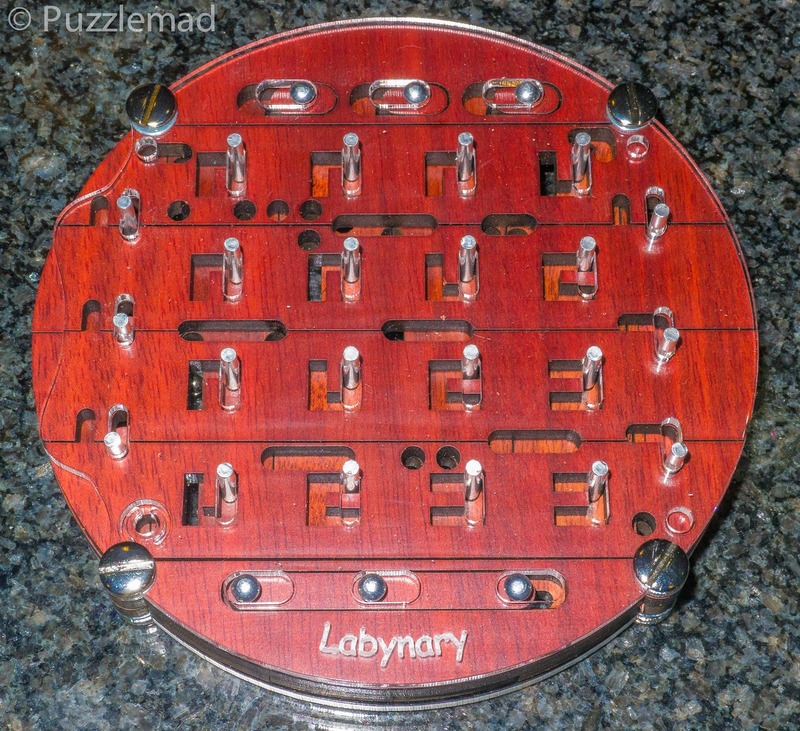 It's not a bad price and if you can get a copy of Labynary whilst you're at it then you may well have the 2 best N-ary puzzles in existence. Go on! You know you want to! Some of you who follow me on Facebook may have seen my disappointment when my Fire puzzle from Pyro puzzles locked up and could not be solved. I have to say that Steve was excellent and immediately offered for me to post it straight back to him for repair or replacement but it turned out that he would be in the vicinity this month and he even offered to pop in for personal service (of the puzzle kind)! Today, after 5 minutes of fiddling with the internals and a couple of hours of tea, chat, good company and puzzling with some of my collection, I have a beautifully restored fire puzzle and am ready to go again! Now THAT is personal service! 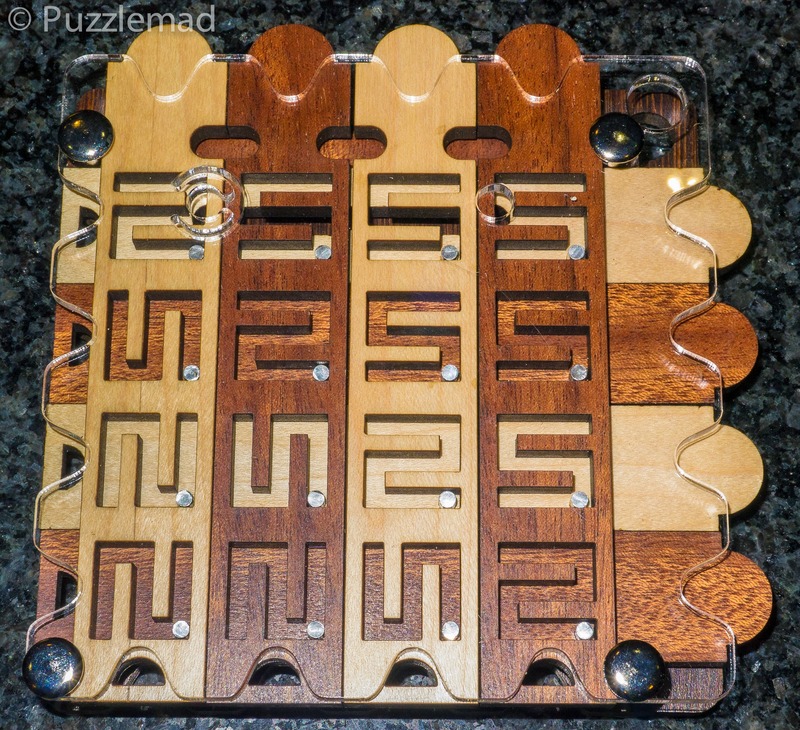 Steve has sunk a lot of his own money into this endeavour and needs to sell quite a few before he breaks even and only if he breaks even can he continue producing the next puzzles in the elemental series. I have to encourage you all to go online to buy this puzzle so we can ALL enjoy the series. They are beautifully made, VERY difficult to solve and well worth the cost. Plus if you do have any problems then you get great service from Steve! Buy them here or here and enjoy!